We donated to our student Donna Bibby’s Marathon run for ‘Sense’, a Charity for deaf and blind children! An incredible group of dedicated fundraisers ran the Virgin Money London Marathon for ‘Sense’ on Sunday, 24 April 2016. Our student Donna says: “Your kind donation has helped to pay for therapy to stimulate the senses of a child who is deaf and blind. The parents will be able to communicate with their child through this. Your donation has made a huge difference. I raised £1600 for the charity. I work as a nurse and met a child who was deaf, blind & really unwell. I couldn’t talk to him or let him lip read even. I needed to take blood & had no way of preparing him for this or reassuring him. Thankfully, his trained carer came & communicated via a sign language on his hand. I vowed to find out more. I enjoyed running but never more than 5 miles before. 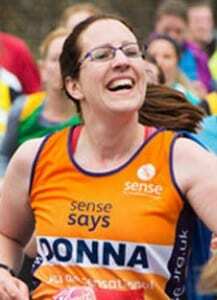 Then I signed up with ‘Sense’ to run the London marathon for them back in 2010. On that first run I met a fellow ‘Sense runner’. He had 2 healthy children but the third, a boy, was born deaf & blind. The whole family were shocked & did not know where to turn. Someone told them about ‘Sense’. He said that him and his wife would not have coped without ‘Sense’. I knew then that I would be a lifelong supporter & fundraiser. I was so relieved & proud to earn that first medal. I raised just over £1400 that year. This will be my 7th year. It gets harder to get sponsorship from friends & family & so I try everything I can.